I've had this itch I wanted to scratch in regards to three items in my O-Gauge collection. Two are just out of my curiosity, but one is more serious and I was wondering if anyone could help me answer these questions, ESPECIALLY the first one. There appears to be a broken wire on the front tender truck of my Lionel #18750 Southern Pacific 0-8-0, from the Lionel #30167 Southern Pacific Merger Set. I bought the whole set, NIB, online off of eBay. I have not roughhoused the tender in any way whatsoever since, and the tender has strictly ran on 0-36 curves. There are sounds, but the sounds function correctly and do not cause any issues. What is this wire for, how can it be fixed (if it can be fixed) and could it cause and problems if further damaged? Now onto the curiosity questions. My Lionel #15067 Southern Pacific Quad Hopper (Also from the Lionel SP Merger Set) has the Road Number and Lettering printed on only one end of the hopper. When it came with the whole set, it was NIB and had never been ran before. I couldn't help but notice that the other cars in the set (Central Pacific Stock Car, T&NO Tanker) have the numbers printed on both sides). Is this a factory error or is this common on all of the SP Merger Hoppers? And the last question. About a year or two ago I was given an O-Line Refrigerator car by a close relative of mine. The reefer came with a cute little rubber figure, but I've never really had a use for said figure because: 1) He doesn't fit onto the end or side ladders. 2) He wont fit on any of the cabooses I have and 3) I do NOT have a layout for him to stand or sit somewhere. For the longest time I've put up with it until now. If this figure does fit on the reefer, where is he supposed to go? If he doesn't go with the reefer, what is he good for? The tracks ahead are rough, but I can still see a bright future for the hobby of model railroading. We've just got to show our youth that the hobby of railroading is just as fun as any video game. #3 -- The refrigerator car was originally distributed by RMT (you can see the markings to the right of the door near the bottom). A lot of RMT cars of that era came with the little guy. No specific use, just for fun ! Are there any exterior lights on the tender? Looks like the wire used for lights, or it could be a ground wire. Are you sure the wire wasn't attached to electrode diode strip above the wire'...?? There is a light on the tender but the catalog never said anything about it lighting up. Is there an axle wiper (copper colored strip with single hole) on the other tender truck? If yes and it has a solid black wire attached to it then that unattached wire is most likely supposed to be attached to the front truck's axle wiper. You would need to confirm that the other end of the loose wire connects to the wire on the rear truck before soldering to the front truck axle. On any other given day I would not have understood a single word of that mumbo-jumbo but I can confirm that the solid black wire is connected to that axle wiper on both the front and the rear truck. This wire however appears to be for something different, and it is NOT the contact roller (there is a black/white colored wire connected to the front pickup roller). There appears to be a small soldered blob with the tiniest hints of copper-colored something on the drawbar of the tender. This is the first steamer I've gotten that has sounds, so I don't know if this part is significant or not but since it caught my attention I'd like to know if this is what it was connected to, or if it served another purpose. This is the ground wire. Since the axles have plastic bushings on the ends, this wire and axle wiper are needed to establish electrical contact between the wheels and the tender frame or sound system ground. Since the wire is probably too short, add a piece of super flex wire and re-solder the connection. Otherwise the sound system may be intermittent. When the Chinese need flexible wire, instead of using super-flex wire, which has many small strands, but is expensive, they just use smaller gauge wire which breaks off more easily. The sound has not caused me any issues when I've run, but is it recommended that I solder the wire on the off-chance something goes kablooey-sputter-sputter-I-have-to-go-to-a-service-station-now or can it still work without it being soldered? It's your train. If you try it, you will find out. The figure... he’s good for second floor balconies! I’d guess that’s your broken connection but why there’d be a ground wire connected to the drawbar I can’t guess. The parts diagram also shows two ground wires from the truck but not where they connect to. That solves it, thank you very much! Now if you'll excuse me, im gonna go figure out how to solder or get someone to solder that. Darn...no buildings just yet. Thanks though, looks really neat! I'll take a shot at this. The loco is an 0-8-0 so there are limited number of flanged wheels actually making contact with the outside rails. In order to ensure the loco has a complete circuit it uses the tender through the drawbar as an extra ground path as a backup. Do you have a Madison obesrvation car with a back porch? Glue him so he is hanging onto a tranformer handle. Your observations were spot on, throw a little shaving cream at it all and Occam's Razor does it again. Good eye. I like the transformer idea... Oh and im not gluing him to the 7 different cabooses (or cabeese? I dunno...) because I don't want to damage either the caboose part OR the figure. The figure is called Little Walter.. As in Walter at RMT. I could see "Nah" being a perfectly acceptable answer too; just thowing out ideas here, wild to mild. The "spellwreck" insists thats how offhandedly should be spelled. Resistance is futile. What manufacturer is the stagecoach? Oof, thats my bad then. "Nah" WAS my response when I read the response. I should really word things differently. Thanks though for the tip, I'll be sure to remember those names on the off-chance I feel like sticking "Little Walter" (see response above) to the caboose deck or anywhere else I please. 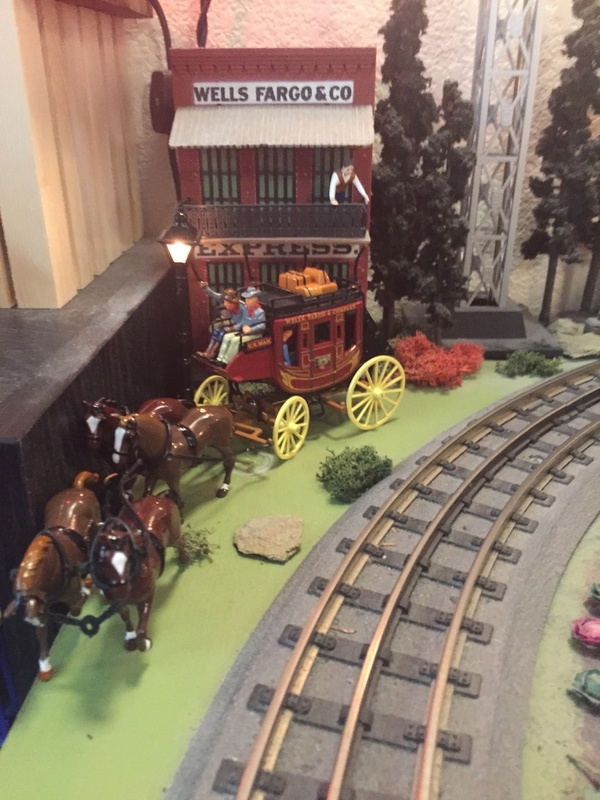 Matchbox Models of Yesteryear 1875 Wells Fargo stagecoach. You've got some catching up to do if you ever want to equal my foot-in-mouth prowess. I don't think your posts even qualify here. Some days the words flow well for us, somedays they don't; oh well. I guess I often come across as condescending to some folk at times. It usually isn't intentional; wasn't meant to be here either. I'm already kinda used to questioning my own reponses fyi; Asperger's often means the path less traveled is mine regardless. My communication skills outweigh my lack of social finesse, but unfortunately they don't bury it. It is high tack, stays pliable and is easily removed. It will get into molded wood grain, but a dry toothbrush will remove it. So the tender does light up...Im gonna have to try that out as soon as I find a 9-volt.